If you’re brave then you’ll most likely want to drop in the locations where you can find the best loot when you’re playing Blackout. I say if you’re brave because wherever there’s loot there are players. Dropping at these locations can lead to a quick death if you’re unlucky enough to not find a gun quickly. Nuketown is my personal favorite place to drop; there’s tonnes of loot to be found and if you manage to survive in Nuketown (which will usually involve taking out at least one other team) you’ll be relatively safe, as rarely do people run to Nuketown after the game has started. Activity there seems to be limited to early-game. Nuketown has two levels to it; the above-ground level is littered with houses which all contain loot, but the best loot is found underground in Nuketown’s bunker. 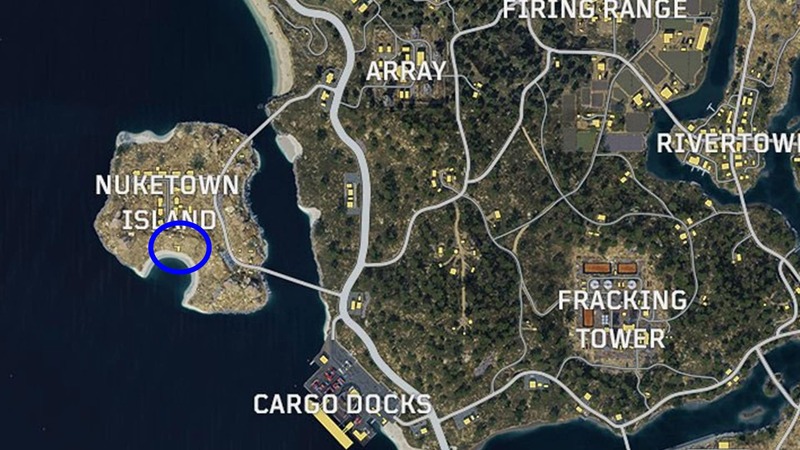 The best tip I can give for dropping at Nuketown is to drop close to a bunker entrance, my personal favorite is the bunker entrance that is on the beach (highlighted in blue above). The reason I prefer this entrance is that there’s almost certainly some good weapons in the first room and if nobody is behind you by the time you clear the first room it’s very unlikely that anyone will get behind you as you progress through the bunker, this means you only have to watch one way – in front of you. If you were to enter the bunker through the other entrance (that can be found above ground between the towns buildings) you’ll find that other teams will also make their way down and be behind you as you progress. 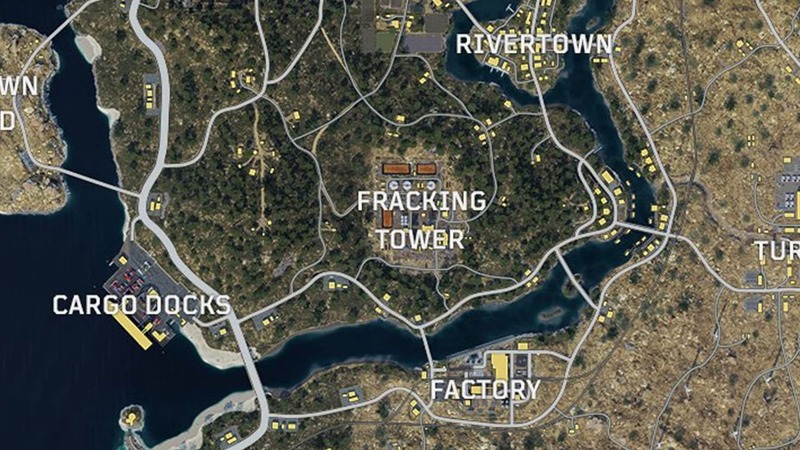 The good thing about Fracking Tower is that there’s a lot of outbuildings, so if you see a team dropping in at the same buildings you were aiming for you can easily divert to a quieter area. Similarly to Nuketown, my personal favourite place for loot in Fracking Tower is underground – there’s something about looting underground that makes me feel safe. If you decide not to head straight to the underground area of Fracking Tower when you drop, please take care if you eventually decide to make your way down there; it’s a major camping spot for players, particularly if it’s in the circle. Usually, if I’m either too slow or if I run to Fracking Tower after dropping elsewhere, I will give the underground area a miss. The key to dropping at Fracking Tower is your drop location. Don’t aim for the small buildings, they will usually only have a shotgun in them and since Fracking Tower is fairly open you might get shot when leaving the building without any means of retaliation. Try to either drop at the underground entrance or at the office blocks. If you’re not first to the main building in Array then head over to the four outbuildings to the west side of Array (the grey buildings with shutters, highlighted in blue above). There’s always decent loot in these that will give you a fighting chance of getting out of Array alive. 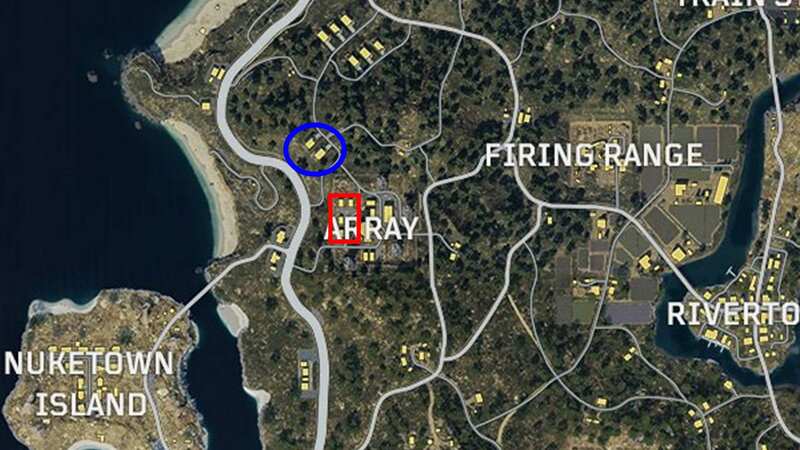 If you’re dropping at Array but you see a couple of teams dropping before you (because you were too slow), divert to the two houses just north of Array (highlighted in red above); there’s usually fairly good gear here and you rarely have company, so it’s a good place to drop before making your way into Array. Strangely, very few people seem to drop at Hydro Dam. It’s pretty underrated – there’s tonnes of loot here and just to the north of the dam itself there are two office blocks that are also contain a good amount of loot. When dropping at Hydro Dam always try to land on top of the buildings, there’s nearly always a gun there and it means you will have the high-ground when making your way down into the main buildings. In my experience, the building on the right (east) usually has better gear in it. If there are other teams around, it might be a better idea to drop at the office buildings mentioned above, which can be found north-west of the Dam (highlighted in blue above). Construction Site is loot central, it probably has more loot than any other location, largely due to its size. ‘Construction Site’ spans several floors, so be sure to check all floors if you drop here. Always try to land on the top of Construction Site; having the high-ground is a big advantage. Don’t forget, with loot comes risk; the Construction Site is probably the most popular place to drop in the game, so you better be quick getting down there. If you do see people landing on the top of Construction Site try aiming for the mid-levels, and if you pick up some Mesh Mines (which are usually found at Construction Site) use them to cover the stairs, as you know people will be coming down them. Asylum has great loot, but it also has Zombies and other teams are also guaranteed to drop here, so this place will probably screw you over more often than not. Choose to drop here at your own risk. The benefit of dropping at Zombie locations is that they do have a pretty high chance of dropping high end loot, but as mentioned previously there will be other players here too. There’s also a pretty cool maze at Asylum that you can use to lure enemies into before taking them out when they get lost. 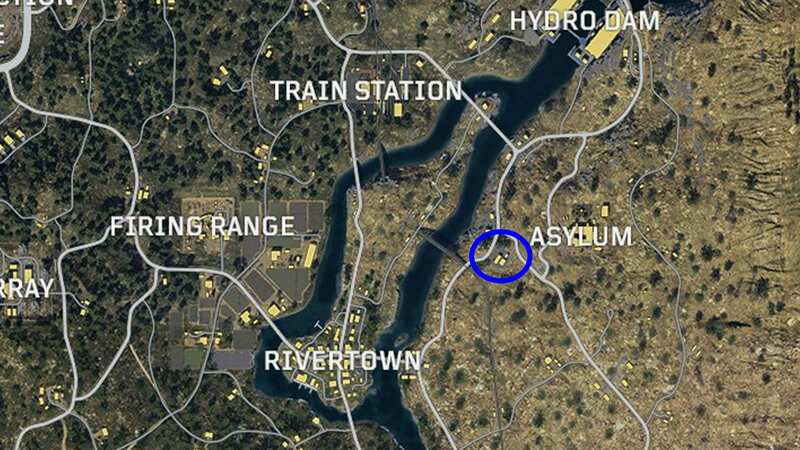 If you’re dropping towards Asylum and you see more than one team drop before you, try diverting to the buildings marked above and then pick people off as they make their way out of Asylum. Estates is a great place to drop, especially if the helicopter route goes across the south of the map, as people will rarely will travel that far north. You’ll almost always find a Level 3 Armor in the car garage to the back of the main building, and weapons plus attachments are littered throughout the buildings. 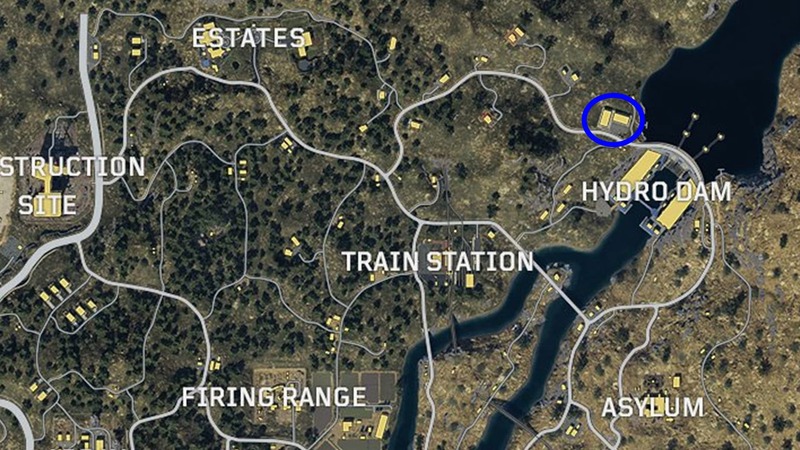 If you get lucky with the circle, the cliff to the north of the Estates (marked above) is a good place to bunker down and keep watch over the buildings in front of you. 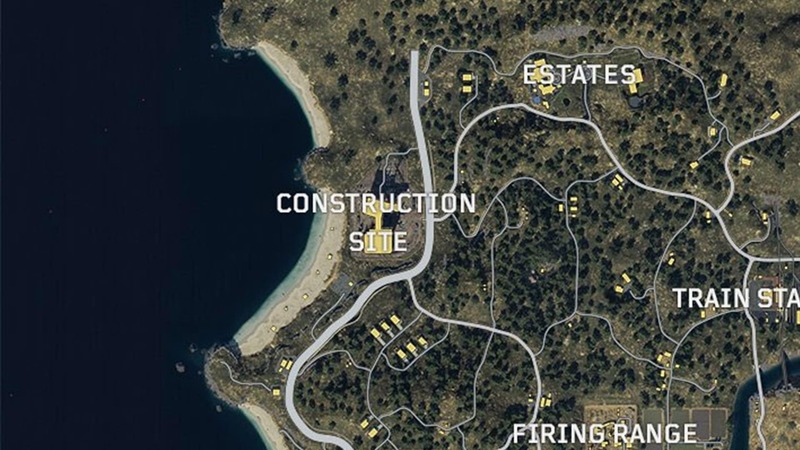 You’ll notice a few big areas missing off this list, specifically Cargo Docks, Factory, Firing Range, Rivertown and Turbine. The reason these aren’t on the list is because the risk outweighs the rewards. 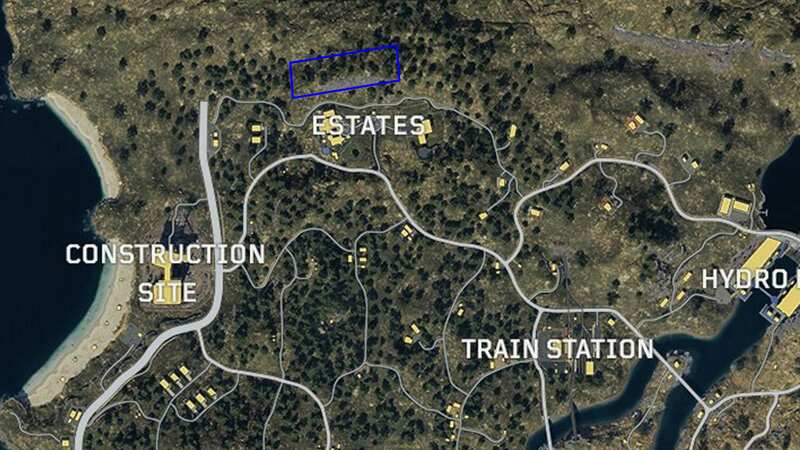 These areas are either far too open or involve you moving between too many buildings, which increases the chances of you getting put down before you get your hands on a gun. For example, if you drop at Rivertown there will almost certainly be another team there, and if the house you drop into first doesn’t contain a weapon you’ll have to move outside where there’s a strong possibility that there are people with guns waiting for you. Where’s your favorite place to drop in Blackout? Let us know in the comments!